Your educational close encounter experience with Jenny’s rescued wild animals lasts for about 3 3/4 hours. We start you off with a coconut drink at our reception and the mandatory safety briefing. Afterwards, we go straight into action with a beautiful display of talent from our fantastic zebra stallion Chaka. Our experienced animal trainer Jenny will show you how 100% positive reinforcement only animal handling works. It is based on trust and rewarding only. Guests can feed, touch and get hands on with Chaka. You will visit Maurice, Max, Monchichi and Mortina, our handsome little Bush Baby monkeys. They love nothing more than a bit of attention and pasta. From here we move to our Vervet monkeys and our ring-tailed lemurs which are living with some more rescued animals in harmony together. We encourage guests to get involved with feeding these loveable critters. You have even more fun if you don’t mind getting your hands a little dirty. Next come Gizmo and Gimmick, our very rare striped hyenas. You cannot enter their enclosure. From your side of the safety barrier, you can feed and watch them from very close by whilst we will try to change your mind about this misunderstood beautiful species. Another exciting moment of your tour is visiting Aslan. He is a genuine white lion, not an albino. He is one of only 300 white lions in the world. Born in March 2014, he has grown up into a strong huge male. This is why you cannot enter his enclosure. You can watch him eat his fresh meat from your side of the safety barrier. 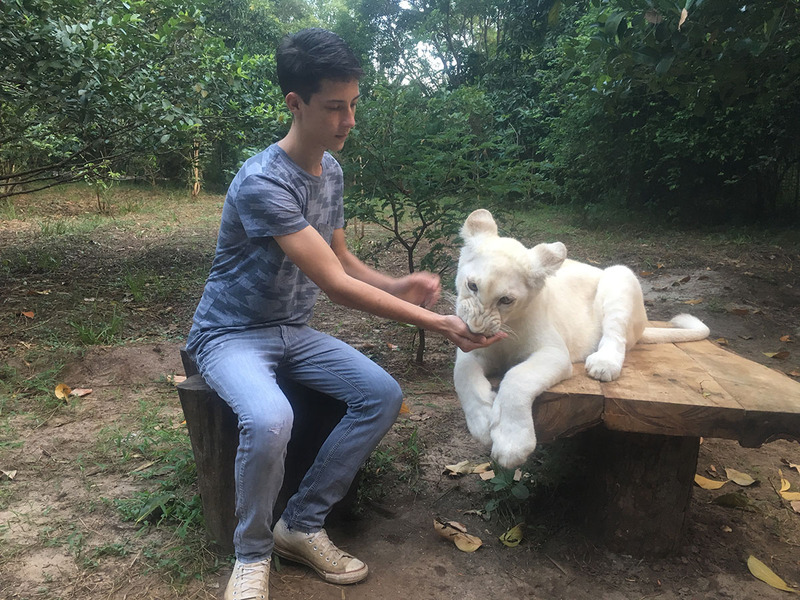 While observing Aslan, you will receive valuable information about white lion conservation. A special moment of your tour will be to meet our white lioness girl Savannah. As she has grown up into a young lioness, you meet Savannah up close, but from your side of the safety barrier only. As with all the wild animals on Cheetah’s Rock, you are very welcome to take photographs of her. She has been a really brave girl ever since she came to us. 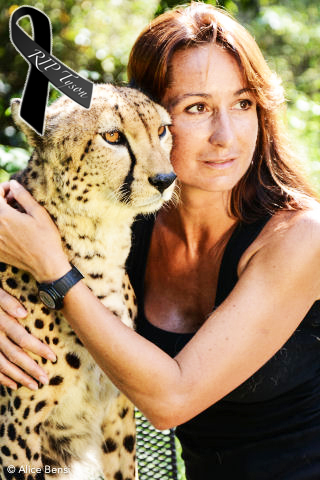 It is with great sadness that we need to inform you that our beloved Cheetah Tyson has died. This tragic event took place despite all veterinary efforts, in his tenth year of life. Our veterinarian specialist for big cats diagnosed bacterial pneumonia as an immediate cause of death. He did not rule out that Tyson had been suffering from a progressive disease such as lung cancer for some time. Cheetahs, who have a generally weak immune system, tend to develop this type of disease as they get older: few cheetahs live longer than 8 years. Tyson was with us since 2011. He was the first big cat we took care of. He loved always to interact with humans who respected his free spirit. He enjoyed receiving love from us and from dear visitors. He was a member of our family. He will be remembered for his majestic yet gentle nature by all of us. The sound of him purring happily will ring in our ears forever. The death of Tyson is a shock to the entire Cheetah’s Rock team. It is a heavy blow to our efforts to build a group of genetically unrelated cheetahs here in Zanzibar. In July 2018, we were able to receive two cheetah brothers from an accredited Conservation Center. We expect to get one or two girl cheetahs later this year so we can contribute to the conservation of this very endangered species.